The last day of 2006 and it seemed like a good idea to stand on top of the world. 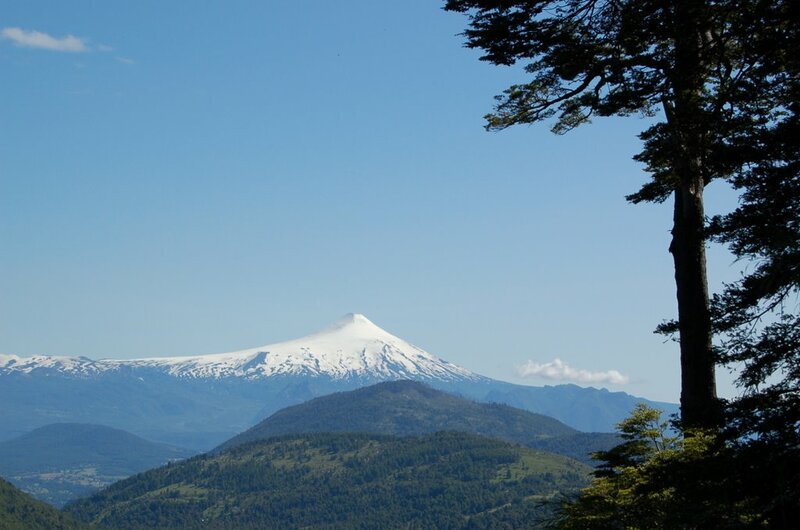 And the nearest we could get to that in Pucon was Volcano Villarica, 2,847 metres of perfect cone-shaped mountain. We signed up to the ubiquitous "last two places" and were fitted with solid boots and purple and orange branded jackets and trousers. 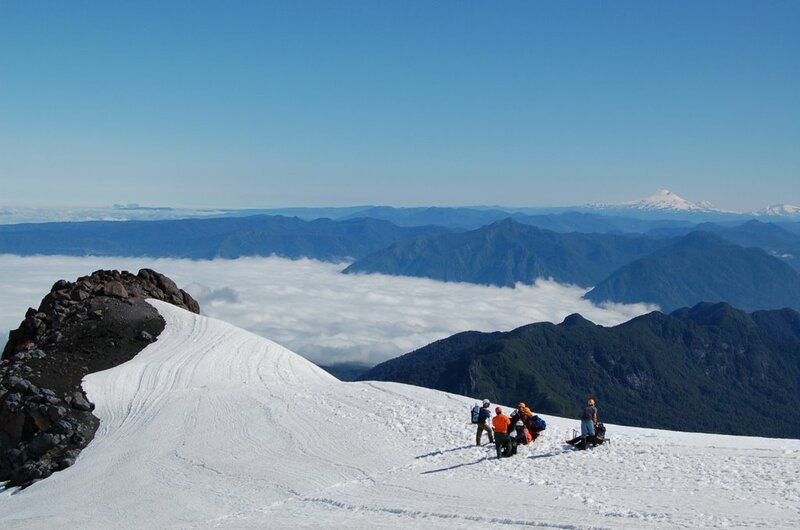 The forecast for the following day was looking good and we went to bed dreaming of blue sky and white snow. We woke at 6am to low cloud and an ominous darkness. Neither of us said anything, but we will were both wondering if the trip would be cancelled. We met the other 25 punters at the Politur office and we geared up before boarding a bus for the 40 minute drive to the Villarica ski station, a decaying set of three lifts and a tin-roofed cafeteria. As the road headed uphill, we broke through a low sheet of cloud and found ourselves in perfect weather. The carpark was already full and, at a conservative estimate, we would be sharing the hill with 200 tourists. Like Disneyland, but a little bit more dangerous. 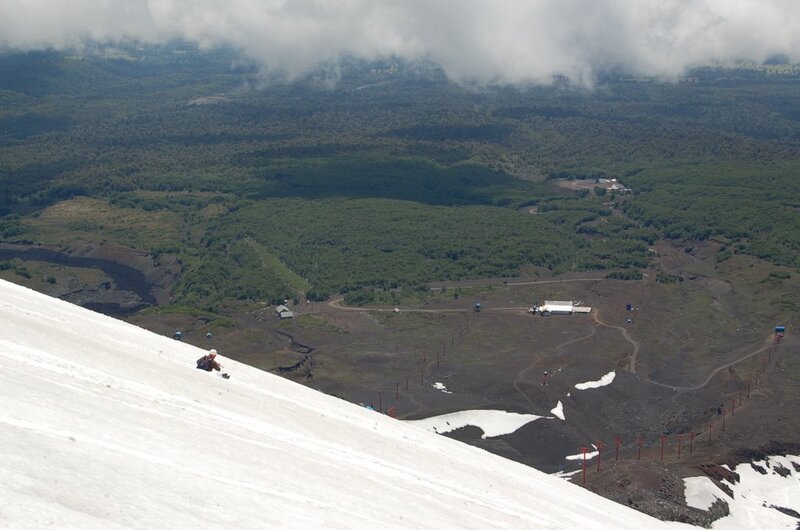 The guides "recommended" that everyone took the ski lift to cover the first 400 metres of the 1,400 metre climb, but Albane, I and a tall Brazilian called Luis decided to walk and spent the next half an hour climbing steep, loose pumice. It proved to be the perfect tactic because, instead of being in a group of 10, we had one guide, Jorge, to ourselves. 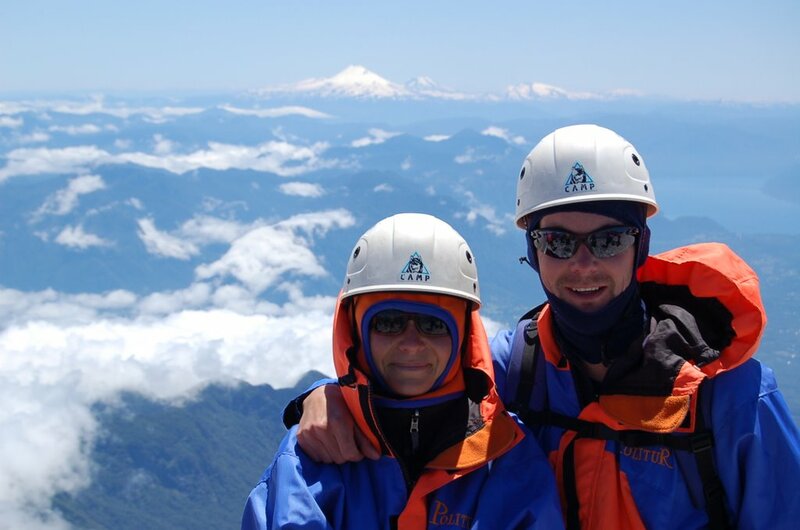 We donned helmets and unstrapped the ice axes from our rucsacs and started the climb. It was easy walking at the steady pace set by Jorge, but even so we overtook a number of plodding lines of people. The view was stunning - ranges of snow-capped mountains, white volcanos and green lakes. About halfway up, we caught the main Politur train and ate cold pasta in a building wind. 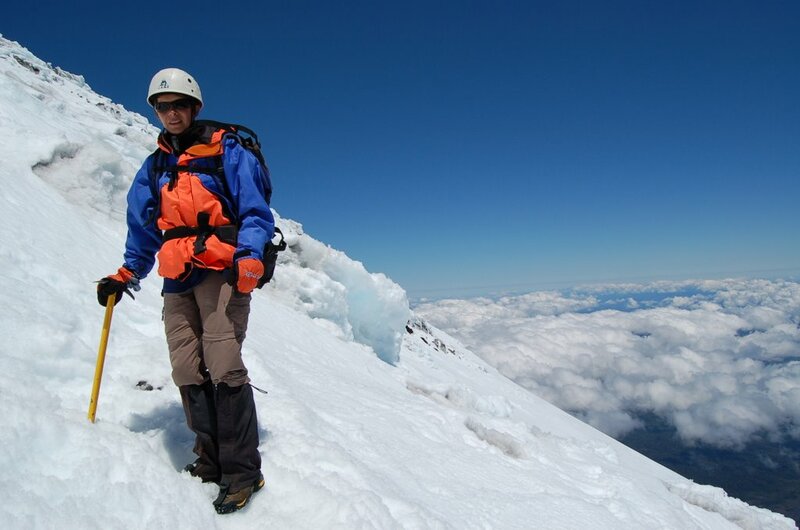 The snow steepened and the guides were shouting commands at their charges. We strolled past and rached the final section with a long line of people strung out beneath us. The summit was a surprise - a 100 metre wide crater spewing toxic green, sulphuric acid gas into the air. The wind swirling it into a towering column and the odd whiff that we caught was choking. It was the smell of chemistry lessons at school. We took in the view, snapped a few pictures and then descended in a slightly less cautious manner than the ascent. We must have slid the 1,000 metres to the top of the ski lift in under an hour, skidding down steep channels in the snow like out of control kids. Our ice axes were supposed to slow our descent, but served only as lethal weapons as we careered down the slope. It was excellent fun and a little mad, but we all loved it. Back on dry land, we packed our kit into the rucsacs and ran down the scree slope to the car park. It was a great day out, not as hard as we had expected and a cool way to see out the end of 2006.